Love the first guest comic. The story is on point and the art is terrific. You can really tell the game store guy is so into the mission of finding the perfect game.This really hammers home the importance of finding a good FLGS. So many games in my collection came from conversations just like the one above. And of course from all the games featured in this comic. I added Dead of Winter, Citadels, and Love Letter to my collection in the last 4 weeks after catching up on the archives. None of those have hit the table yet but I was inspired to finally bring my copy of Pandemic to the table a couple of weeks ago by your comic. Thanks for the feedback Jesse! Delighted to year you were inspired to add games to your collection after reading the comic. You have no idea how happy feedback like that makes myself and Aileen. It’s like an early Christmas present 🙂 I say early, because I presume you are also sending us an actual Christmas present. Right Jesse? Thanks Jesse. The guy in our local store is a real God-send. He seems to have nearly infinite patience for my dumb questions. I think I’m going to try to convince my wife to try Dead of Winter over the Christmas holidays. Gloom was given to me a couple of Christmases ago by friends who didn’t really know I had just got back into gaming. Which was odd. But also awesome – I love it. I’ve struggled to get my wife to play most of my games 🙁 She likes Catan and Darjeeling, but usually can’t be persuaded to choose much else. Oh, I really want to try Burgle Bros. I’ll have to see what the cost is once it hits retail. It’s been a long time since I played Gloom myself, but I do remember enjoying it. Great sense of humour, and the transparent card design is really nice as well. Every game of Gloom I’ve played has been memorable for different reasons. It’s one of the few games where there are times when you genuinely make a decision for the benefit of the story more than for “winning”. Hi Ben, Gloom was a big hit in our house even though my wife really wasn’t interested in games to begin with. She has just reminded me that the game that really hooked her was Tsuro. You could try that. Hello everyone. First of all, thanks to Colin and Aileen for allowing me to write a couple of guest spots for them. I think Damien and Chris both did excellent work on this week’s story, so thank you to them too. I hope you will forgive me if I don’t quite reach the heights of Colin’s usual stories. I think it’s remarkable he maintains such a high standard each week. I am a mere beginner by comparison but I hope you enjoy the story and it raises a smile. 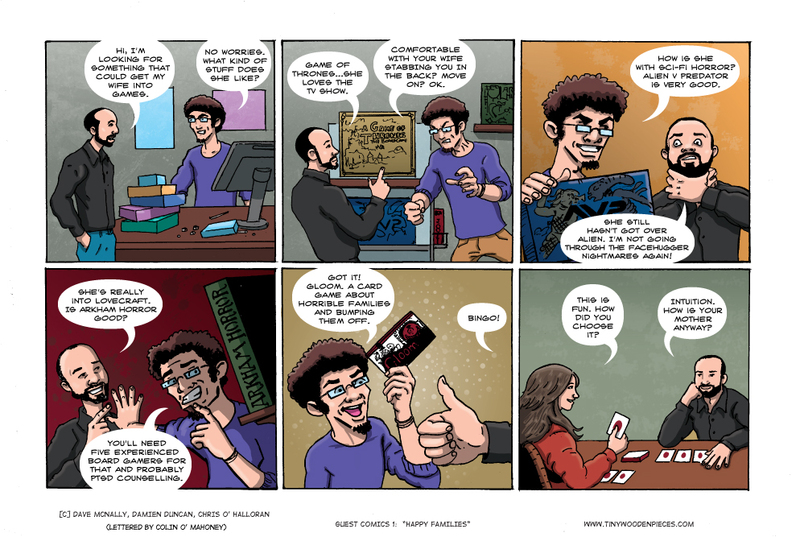 This story is based loosely on a real life conversation I had with the absolute gentleman who runs our local gaming store. We eventually played (and thoroughly enjoyed) Gloom on his recommendation. As Colin said in his blog post I read his archive in preparation for writing this story and found myself back in the Game store. This time i left with Love Letter, Pandemic and Elder Sign. My wife, originally unenthusiastic, turned out to be a merciless destroyed of dreams playing Love Letter. We moved on to Pandemic, in the hope that a co-op game would be less likely to leave me weeping, and it was a big hit. Elder Sign is next and we are firmly on the path to being dedicated board gamers. I am still nominally a wargamer but the next story shows exactly how much gaming time real life has allowed me recently. I hope you will read that one too and let me know what you think. Great comic. Looking forward for the next one. Haven’t played Gloom myself (only seen it on Tabletop), but it looks like a fun game with unique theme.